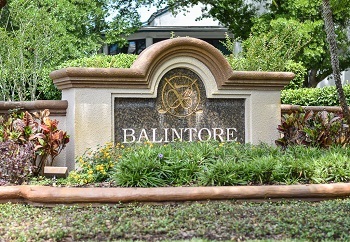 The upscale tidy community of Balintore in the heart of Palm Harbor's East Lake area is not a neighborhood you may have heard about, but is one you should definitely see. From East Lake Rd go west on Village Center, then right on Indigo Pond and right on Balintore. It is very close to the public Lansbrook Golf Course. You will love the open floor plans of these homes that show with casual elegance. Many homes for sale feature swimming pools with spill over spas, walk in closets, security systems and beautiful kitchens and baths. It is a great small neighborhood that is close to shopping, dining, and a short drive to the airport. To keep you active there are also gorgeous parks, the YMCA of North Pinellas, the Pinellas Trail and minutes from beautiful Lake Tarpon. It is truly a great location! Homes in Balintore are priced well for the area and one not to miss. If you are looking for a smaller quiet community in Florida with mature landscaping and pond views, check this one out! If no homes are available, ask us for an email alert of new listings, there's no doubt they sell fast in this lovely neighborhood. Selling your home in Balintore? Contact us for information on selling your home in Balintore. Give us an opportunity to show you our marketing plan for the successful completion of a happy buyer and a happy seller. We are confident we will get you the most out of a possible sale. Flexible commissions help you save money! Enter your contact information in the form down below to find out more!